Rafiy at 3 months | escaped. I remembered yesterday that Rafiy is now 3 months old (when he couldn’t fit his newborn socks anymore) and I have yet to do a post on his milestones. So in case Rafiy read this blog many many years down the line and couldn’t find his milestones post, here’s one. I know I whined about him being a difficult baby before, but he’s recovered now Alhamdulillah – no more hair-tearing stress for Mommy at night and nighttime has been less stressful. If before I would wait for nighttime with anxiety, now that I understand him a little bit better, I know what to prepare and expect by the time he wants to go to sleep. And this helps tremendously – so I guess the key is to understand the baby’s cues about what he wants (a skill I have yet to master sob). 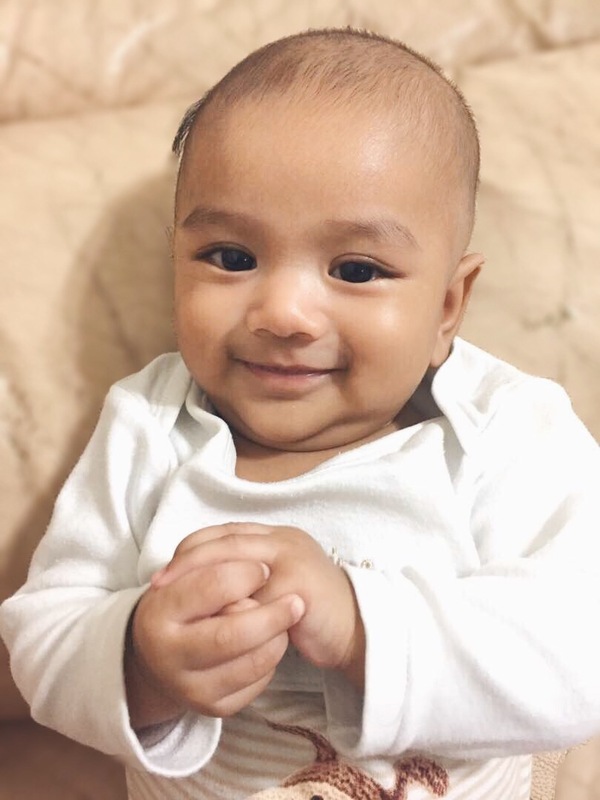 But aside of all that, truthfully he’s such a smiley baby – in fact he’s been smiling a lot more than Rayyan when Rayyan was his age. When he’s not grumpy to sleep, he smiles and coos and talks like nobody’s business. Rayyan likes to kiss and smother Rafiy a lot, much to his dislike I think cause he keeps pushing Rayyan’s face away whenever he does that haha. Easily distracted by Rayyan’s voice, cause whenever I was feeding him and Rayyan is around, he would pause and look up to see his brother, stare a bit, and continue feeding T.T And this cycle would be repeated over and over wtf. Getting him to sleep while Rayyan is around is impossible, I honestly don’t know how other mothers with small kids do this! But the thing I love the most atm? When someone else is holding him i.e his daddy, he would look around the room until he spot me and just do his stare bit – until I was out of the room. This one, I love. gah...i miss having a baby but i'm not sure if i have the energy..
sigh..motherhood is so beautiful, right? #teamcrying ensues haha. Motherhood is beautiful alright!